Treating rhetoric and symbols as central rather than peripheral to politics, Lisa Wedeen's groundbreaking book offers a compelling counterargument to those who insist that politics is primarily about material interests and the groups advocating for them. During the thirty-year rule of President Hafiz al-Asad's regime, his image was everywhere. In newspapers, on television, and during orchestrated spectacles. Asad was praised as the "father," the "gallant knight," even the country's "premier pharmacist." Yet most Syrians, including those who create the official rhetoric, did not believe its claims. Why would a regime spend scarce resources on a personality cult whose content is patently spurious? Wedeen shows how such flagrantly fictitious claims were able to produce a politics of public dissimulation in which citizens acted as if they revered the leader. By inundating daily life with tired symbolism, the regime exercised a subtle, yet effective form of power. The cult worked to enforce obedience, induce complicity, isolate Syrians from one another, and set guidelines for public speech and behavior. 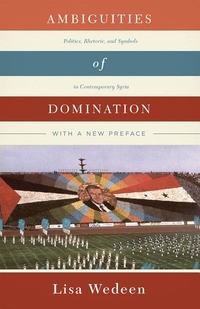 Wedeen's ethnographic research demonstrates how Syrians recognized the disciplinary aspects of the cult and sought to undermine them. In a new preface, Wedeen discusses the uprising against the Syrian regime that began in 2011 and questions the usefulness of the concept of legitimacy in trying to analyze and understand authoritarian regimes.